Freight villages are macro-logistics systems including an access to road and rail as well as to waterways and air transport. In addition, the neutral management of freight village is important. 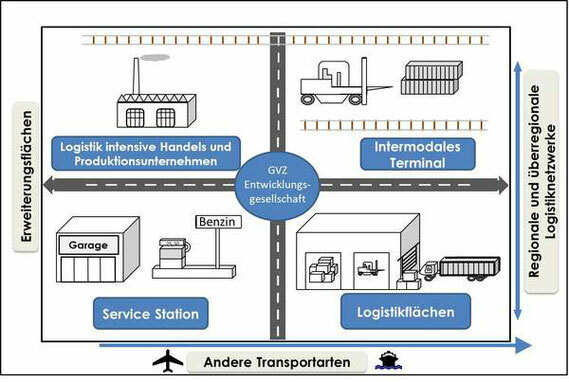 These features of freight villages are generally attractive for logistics operators as well as for logistics-intensive producer, supplier and trading companies. Despite of the existing differences between the logistics sites, the initially defined planning assumptions, also reflected in the state and federal principles for freight villages, has been justified. Beginning with the Freight Village Bremen (1985), in 25 years the freight village network including 35 sites has evolved in Germany. The freight villages are different. The reasons are different time and level of freight village development, size of areas, as well as demand and concentration of logistics services and logistics companies in the regions. In freight villages, overall, there are about 1400 companies with more than 60000 employees. The key success factor there is development of intermodal terminals, covering a large area. The traffic shift from road to rail and waterways in freight villages contributes to reduction of polluting emissions caused by freight traffic. Freight villages are logistics consolidation points in the intersection of short and long-distance traffic, which facilitate the optimisation of delivery in the city centres and reduce traffic congestion. Many cities have succeeded in shifting the logistics facilities, providing conflict in use, to freight village. Hereby the new urbanistic activities and positive effects of traffic shift were achieved. Moreover, the extension of freight village areas had an effect for für Neuansiedlungen zur Kanalisierung and contributed to concentration of long-distance traffic in the periphery of the cities. The green logistics and sustainable development of site is increasingly discussed in the freight centres. There are a range of solutions, including sustainable logistics facilities, development of clean vehicle technologies and city logistics concepts. A more detailed description can be found in the study „Effekte der Güterverkehrszentren (GVZ) in Deutschland“ ("Effects of freight villages in Germany", only available in German), which was prepared by the ISL and LUB Consulting GmbH for the German Federal Ministry of Transport, Building and Urban Development.